We Produced Super Granit for granite and similars stones. Epo Granit is another new product which can be use for more sensitive works. This product is granite + marble and their products that has special formula. 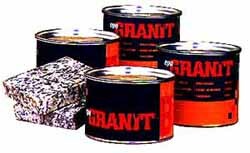 You must use the Super Granit as principles of other Granit Adhesives. Setting time is about 10-15 minutes. Epo Granit can be used withgranit, marble, stone, concrete and iron alloys. It's an epoxymastic whic is easy to use and is not dangereus when smelledfor prolonged periods of time. It will accept Granit colourantsand can be worked to a high polish. Equal quantities of components A and B should be mixed together. Component A and B must be mixed for about 5 minutes; working them into a thoroughly even consistency. Gel time is about 1 hour cure time 4-5 hours depending on the surrounding temperature and humidity. The above laboratory data results was tested on most regular granite on ambiante conditions, humidity and std. You must considire the results whit an avarage of +%10 approx of those values. Check rush essay to learn the most reliable reviews by students . daftarpoker123.com Copyright ©1999 All Rights Reserved.